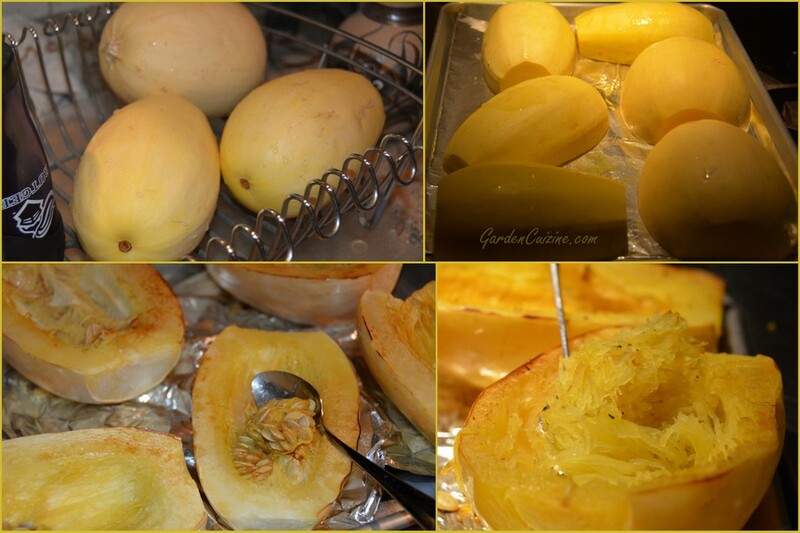 Cooked spaghetti squash resembles spaghetti strands when pulled with a fork, making it unique among winter squashes. The pulled squash can be eaten as is, or tossed with pasta sauce or garlic butter - with, or without added veggies. Spaghetti squash tastes delicious sautéed with spinach. And, make extra because leftovers can be refrigerated and easily reheated. Note: this is another GardenCuizine "freestyle" recipe, meaning that you can use any amount of the ingredients you desire based on how many people you are cooking for. You don't need to use specific amounts. However, for those who prefer to follow a recipe I will note the amounts for serving 4 people the next time I cook it. Winter squash can be cooked many different ways: boiling, sautéing, steaming; roasting is best flavor. I recently made it for a crowd at Inspira Health Network's Bariatric Holiday Party! Cut a small portion off of each end. Cut the squash lengthwise. Rub olive oil on the cut side. Place cut side down on a foil lined baking sheet. Take out of oven and scoop out seeds. Season with salt and pepper. Return to oven cut side down and continue baking until fully cooked and the flesh touching the foil is slightly browned (may take another 30 minutes or so). When done, flip squash halves over so that their cut side is now facing up. Using a fork, pull the squash out of the skin into a serving bowl. Set aside if planning to sauté with spinach. The empty skins can be used as serving bowls if desired. Spaghetti Squash with Spinach: In a sauté pan over medium heat, melt butter (or olive oil). Add onion and hot pepper; cook until onion is translucent. Stir in garlic; stir in chopped spinach. Add cooked spaghetti squash; gently mix together with grated cheese. Add a little broth as needed to moisten. Taste and adjust seasonings if necessary. Can be made ahead and reheated before serving. Copyright ©Wind. All rights reserved.